My local natural-foods/farmer’s market/health products store is stepping up their gluten-free offerings, which is very welcome, of course. It’s nice to see some products that I’ve salivated over in the pages of Living Without actually on the shelf of a IRL store. The bad news first: In short, Enjoy Life’s Very Berry Crunch is simply awful, perhaps the worst packaged g.f. product I’ve ever eaten. In fact, it is causing me to be extremely hesitant to ever buy any of Enjoy Life’s products, and that is a shame, because everything they make is not only gluten-free, but free of all of the other “common” allergies: wheat, dairy, tree nuts, peanuts, egg, soy, fish & shellfish. Since my son Wes can’t have five of those eight things, I can’t tell you how freeing it feels to simply be able to grab anything made by that company and KNOW it’s safe. But, if it’s safe, yet tastes like cr@p… well, that’s not much of a trade-off. But — and this is more an annoyance than anything, the size of the box dwarfs the size of the enclosed bag. This is both wasteful and deceptive, and means that one has to pull out the internal bag every time one wants a serving of the cereal, instead of unfolding the plastic and pouring. Also deceptive is the product photo, which bears little resemblance to the actual product. The actual granola is in alternately huge chunks and grainy bits, and unappetisingly dark in color. I’m in serious doubt that the product pictured on the box is actually the cereal. It’s really that dissimilar. The box I purchased bears a graphic that proclaims “NEW crispier crunchier taste!” I shudder to think of what it might have been before, because the cereal is no where near crisp and crunchy. It’s dense, hard, oddly chewy, and very difficult to chew — it has the texture of something really hard that was set out all night in a humid room. Also, when one purchases something called “very berry,” one might reasonably expect some berry taste. This “granola” tastes mostly like coconut, with berry seeds. The second new-to-me gluten-free cereal will certainly grace our breakfast table for years to come. Oddly enough, as I inspect the box, I see that the brand, Perky’s 100% Natural, is actually a sub-brand of Enjoy Life. That’s unexpected. We have eaten Perky’s Nutty Rice before — kind of a gluten-free (and nut-free) version of Grapenuts. It’s pretty good, though fairly bland. Wes saw the PerkyO’s ad in the above-mentioned magazine, and asked me weeks ago if I could buy it. Until Wednesday night, though, I’d never seen it in the store. Not only did I spot it on the shelf, but it was on sale — about $3, instead of the regular price of about $4/box. Upon opening, it has a scent akin to Apple Jacks, which seems a fake-apple flavor/scent. But, an inspection of the ingredients states that the only flavoring added (besides cinnamon) is “natural apple flavor.” Reaching into the bag (which again, is a little too small in relation to the size of the box, but not as bad as the Very Berry Crunch), I was a little startled by the texture, which didn’t feel Cheerios-ish at all. Then, I realized that the O’s are dusted with powdered sugar, which lends to the smooth and starchy feel. It looks rather like off-brand Cheerios, if you KWIM. The cereal itself tastes great, though probably appealing more to kids than adults. It has a good crunch — a light-in-weight crunch, not a hard, dense crunch. It floats in milk, and doesn’t get soggy quickly (both Wes & I use rice milk, but it seems like it would hold up well in regular milk, too). Wesley loves it, as does Audrey (my 11 month old), who has been happily snacking on it for the last couple of days. Eating PerkyO’s does not feel like we’re sacrificing taste or quality in our quest to remain gluten-free. It has none of the “weirdness” that can sometimes accompany super-healthy and/or gluten-free foods. This cereal, unlike the “granola” above, is NOT made in a dedicated gluten-free facility. However, they do put this disclaimer on the box, which I appreciate: “Strict manufacturing and sanitation practices are employed to prevent cross-contamination. This product is routinely batch-tested for gluten.” That satisfies me. So, granted, this is all simply my opinion and experience. But, I would STRONGLY caution anyone tempted by the attractive box of Very Berry Crunch to stay FAR away, and I would encourage anyone wanting a tasty regular-style g.f. cereal to try PerkyO’s. Dairy-free, TOO??? Oh, dear Lord. I find myself wondering why our family seems to need weird diets. Is it because of the genetic mix between my husband and me? Our kids seem to have gotten the worst and oddest of our health problems, plus some. We already knew that baby Audrey, now 11 months old, had pretty serious digestive problems (frothy green poop and abdominal pain) when I, the breastfeeding mother, ate anything dairy. So, for the last almost-year, I have had no dairy at all, except for the daily dose of half-and-half in my coffee, and the very occasional Ben & Jerry’s Karamel Sutra. Well, this is the time in a baby’s life when the mom starts expanding what the baby eats. So, starting about 3 weeks ago, I started adding a spoonful of plain yogurt to her breakfast (which is typically a fruit puree mixed with rice cereal). She liked it fine, and didn’t seem to be experiencing any digestive difficulties. However, she broke out in body-wide eczema, with which she has never before had a problem. Feeding her breakfast last Monday, a week and a half ago, I asked her — as I was feeding her her yogurt & fruit — “What could be causing this eczema?” Well, duh. I looked down at the little bowl and then apologized to Audrey. Then, I looked over at Wesley, my 5yo, and told him about my little revelation. All of this comes flooding into my mind as I chirpily tell Wesley, “Goodness! I think Audrey is going to have to remain dairy-free! That must be the source of her ecze –” I stop short. I pick up the phone to call Martin. “It just dawned on me that dairy is likely the source of Audrey’s eczema. Do you think it might be the source of Wesley’s eczema and asthma, too? Do you think I should maybe try him dairy-free?” Martin is immediately convinced that this is the route we should go, like right now, cold-turkey, immediately. My heart breaks. He already can’t have wheat, rye, barley, oats, peanuts, soy, olives, carob, citrus or tree nuts. That is an incredibly restrictive diet, but one that we’ve grown accustomed to. He is remarkably cooperative in his diet, and way more aware than any 5yo should have to be of how ill these foods make him, and that the peanuts are truly deadly (he calls peanuts “my mortal emeny.”) However, the boy lives on chicken, corn tortillas, sour cream and cheese. I’ve been in the world of Food Intolerances for so long that I’m aware that this is not just a simple lactose intolerance — it’s the casein. Casein is the protein in milk, and is much more pervasive than lactose, which is the sugar in milk. You can take the lactose out of dairy, but you can’t take the casein out. And, if casein is the problem, you have to take a zero-tolerance stance. No questionable foods, and no cheating. Wes already drinks rice milk (made by WestSoy — the only brand that does not use carob bean gum as a thickener), so that’s not an issue. But, no dairy means no cheese. No g.f. pizza. No butter. No milk in my homemade baked goods. No milk in the prepared g.f. items I buy. No milk chocolate. No ice cream. No sour cream. No cheese. No cheese. No cheese. I’m already a label-reader, but now I’m having to re-read and re-re-read labels. It’s taking me nearly 3 hours again to grocery shop. It’s almost like when we first discovered about gluten. I have sort of held out hope that maybe this wasn’t it, for Wesley’s sake, so he could have his beloved cheese. But, after enduring probably the worst month in his life for asthma, since I started him dairy/casein-free 9 days ago, he’s not had one asthma attack. He hasn’t even been wheezy. He went from 1-3 SVN treatments a day down to none. He’s not had a ONE since last Tuesday. His eczema doesn’t appear any better — in fact, he scratched his legs to bleeding last night. But, it could be that that takes longer to heal up. Or, it could be that the dairy is triggering his asthma, but is not the source of the eczema. Or, it could be that this whole thing is entirely coincidental and he’s just had a good week for his asthma. But… I’m already preparing my heart and my resolve, for the sake of the health of my dear son, to help him forego dairy for life, if need be. I got this from Melissa, the dear woman who feels like the blog-equivalent of my mother, mentor & friend. She said she’d seen it around, but I’ve not. I’ll try it, though. blue eyes with a ring of yellow around the middle from my Scottish Great-Grandmother, Emily Duncan. I was thinking of this poem yesterday, as I was doing laundry. Doing laundry is a good time to reflect, IMO. Poetry inspires in me all kinds of hopes and fears and joys. I decided that delving into poetry is a lot like enjoying wine. The experts tell you to just drink what you like, like there is no right or wrong. However, there also exists the world of wine full of sommeliers who tell you that it’s not “Willamette Valley,” it’s “Wull-AH-m’t Valley” when one is trying to find a wine one likes in the hoity-toity food store… IOW, even though the knowledgeable ones will insist on simply drinking what you like, it turns out that there really is a right way and a wrong way in which to enjoy wine, and the World of All Things Wine can be quite an inhospitable place. But for those who understand the ways of wine, and who take the time to educate themselves, the World of Wine can be quite rewarding and enjoyable. So it is with poetry. I hardly deem myself knowledgeable about poetry (or wine, as evidenced by the steward’s gentle — but needed, apparently — correction). However, I have tasted a few of its joys, and I wish to know more. I fully remember being six years old, and in Mrs. Gibson’s first grade classroom, and opening my literature textbook (which, incidentally, I think are largely travesties — go read the whole book, silly, not just an excerpt!!) to discover Robert Louis Stevenson’s “The Swing.” It took my breath away. I was agog that someone could so adeptly capture the rapture of swinging. To this day, I remember the picture that accompanied the text. I have had little love affairs with other poets: Rumi, Kahlil Gibran and Marina Tsvetayeva, most notably. And, I write poetry, but not nearly so much as when I was younger. Yet, the education I received was largely unappreciative of poetry, and I can say with certainty that I, unless I look it up on Wikipedia, have no idea what iambic pentameter is. I’m surprised that I actually know what a couplet is. I love language. I love that I was born into a family of English-speakers. So difficult and rich and complex, history-laden, and derivative language that it is. There’s always more to learn when it comes to the English language. I love how poetry can evoke the most powerful and wistful emotions in, often, just a few words. However, I’m so obtuse. I’m so broad. I am slow to pick up inference (or never do). I don’t get the hints and the things alluded to so often in poetry. I, unless I make effort not to, read things at face value, which means I often miss what the author intended, sometimes aware that I’m not “getting” it, and sometimes blissfully ignorant, not knowing that I should be embarrassed about my stupidity. Poetry can do that: it can make me feel stupid and lacking in depth. Or emotion. Or something else unknown to me. The current book of poetry that we’re reading through is Classic Poetry, An Illustrated Collection, selected by Michael Rosen, illustrated by Paul Howard, whose drawings evoke the era and emotion of each poem. The book is put out by Candlewick Press, which seems to have a special place in its heart for all things lovely and artful. The pictures are beautiful, and there’s a short biography of each poet. It’s really a well-done book, directed at children, but worthwhile for anyone, really. 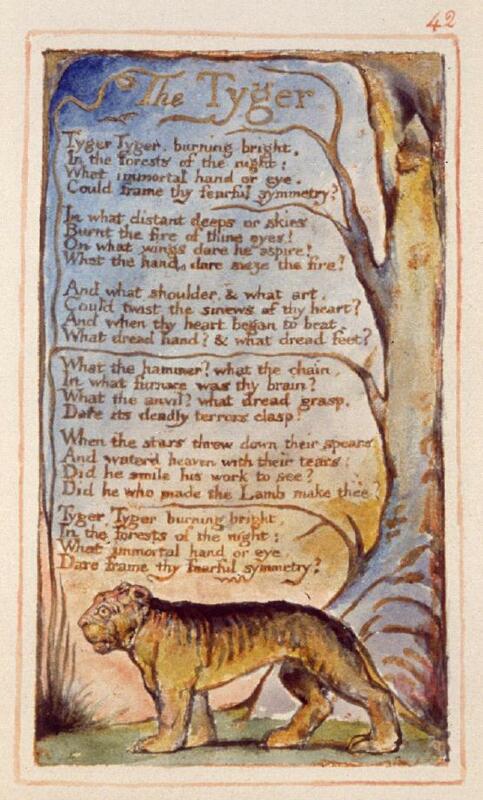 We came upon the poem illustrated above (though that pic is from Wikipedia) by William Blake, called “The Tyger.” (Honestly, I was introduced to William Blake by one of my quirky no-one’s-ever-heard-of-’em bands, Daniel Amos/DA in this lovely song by musical genius Terry Scott Taylor.) Since we recently read through A Child’s Garden of Verses by Stevenson, we had discussed how an author’s accent can cause words to rhyme that, according to our Arizona pronunciation, don’t rhyme at all. So! To (part of) the original point of this post — Blake has rhyming couplets in this whole poem. Yet, he ends the first and last stanzas with “eye” and “symmetry.” Blake wrote in the late-18th and early 19th centuries. Back then, and with an English accent, did those two words rhyme? We read it both ways: “symme-TRY” and “symme-TREE.” The first sounded funny/odd/senseless, and the second did not flow. We know that not all poems have to rhyme, but when a poem is written in otherwise obvious couplets (bright/night, art/heart, spears/tears), it’s apparent that, somehow, it’s supposed to rhyme. In all other ways, it’s such a powerful and beautiful poem. We also discussed the idea that, back then, there was no photography, no video. It would have been a rare and spellbound person who actually saw a tiger. We are so satiated with images that even the tiger, readily seen at zoos, holds not the mystery that it did for William Blake. He was completely unjaded, unabashedly awed. Could frame thy fearful symmetry!? Several years ago, I found a series called Great Illustrated Classics. The publisher, Baronet Books, takes a well-known piece of classic literature, and adapts it into an inexpensive hardback, 200 pages+, with large type and a full-page illustration on every other page. I had some qualms about getting these books for my kids, since the originals are so much more worthwhile. But, it was my hope that these books would introduce them to the real thing, and eventually, when their reading proficiency advanced, they’d want to read the original. The risk I ran was that they’d forever be satisfied with an inferior, simpler work. I’m happy to report that the risk paid off. The older boys (age 7 & 9) are now starting to read the “real thing” — though they still enjoy the adaptations. And, now, even my 5yo slowly (and with mom & dad’s help) read through our copy of Robin Hood — and I just saw a “bigger” Robin Hood book on his bed that he’d been trying to read, which prompted this post. We own 8 or 10 books from the series, and have checked many more out from the library. They can commonly be found for around $6, but I think I bought all of ours off of www.half.com for less than $2 each. Also, if you’re a Sam’s Club member, they have a smokin’ deal of 20 titles for around $40, including shipping. Some of the books aren’t really appropriate for really small children (The Count of Monte Cristo includes the suicide, for example), but those aged 5 to at least 10, and maybe even 12 or older will really appreciate most of the titles, and have a sense of accomplishment for reading such a “huge” book! Well, this Friday past, we revisited Bitter Creek, off of the western edge of Castle Hot Springs Road. It was our third visit to the area. (I may edit this later to post pics, but for now, I don’t have the time.) I went w/ the four kids and my stepdad. It was a really good trip except for the part that greatly disturbed me. The first time we went there, the creek was 100% clear & clean, but there was a mining claim posted nearby. I researched federal mining claims a bit, and as best as I can tell, the claim started away from the creek area, not including the creek itself. The second time we went there, that part of the creek that had previously been clean was filled with white froth and sludge — very sickly-looking. But, we investigated downstream a bit, and found an adjoining creek that was very clean, and we spent our time there. This third time, I printed the topo map of the area, and it looked like it would be a fairly easy hike to find the source of the spring that supplied the newly-discovered creek. And, it was! BUT… this leg of the creek was now totally sludge-filled, frothy in places, and there was a weird white crusting along the banks of the creek. I’m certainly no expert on mining, but it’s my guess that people are illegally mining with some sort of leeching technique. We hiked back into the creek for at least half a mile, and did, indeed, find the source. But, all along the creek, it was an unnatural color, and appeared lifeless. We even saw a dead butterfly floating on a small pool. My stepdad thought that it was just runoff, like a heavy rain had been through the area recently, and left sludge in its wake. But, white crusty, grainy, chemical-looking stuff?? I’m going to find out who I need to speak to at the BLM (since this area is Federally owned) to see if it can be investigated. Ah…. how do I make this a concise post? There is so much tumbling about my mind & heart. Briefly, I’ve been about to lose my mind with my children this week. Think up all the rotten, selfish, prideful, insensitive, disobedient, mean-spirited character traits you can, and you can be assured that they surfaced in someone this week. My mantra regarding behavior is (and probably forever will be), “Do what you know is right, and do not do the things you know are wrong.” But, the boys have been doing things purposefully that they know are wrong, and making no effort to do anything right, kind, loving, Godly, obedient, or self-controlled. I’ve had it. So has my hubby. Our patience has been tried and has worn through. Even my husband, who is mercy personified, is at his end. We have decided to pull the reins in. By that, I mean that we’re done with extending mercy upon mercy upon mercy, and correction upon correction upon correction. Really, we should have done this long ago, like months ago or more, but we’ve just decided to start handing out stiff penalties for disobedience and unkindness. For starters, there is no TV and no computer time for a week. All play in the front yard & beyond, and all play with neighborhood friends is cut off for a week. Also, my 7yo Grant, who is the most motory motor mouth has a “special” discipline of practicing listening to others, showing patience and self control at the table, meaning that he is absolutely not allowed to speak unless Mom or Dad ask him a question. Also, I’m handing out spanks. I hate spanking, and I administer them as infrequently as possible. I may get a host of anti-spanking comments here, but so be it. We don’t abuse. It’s one firm swat with a good-sized wooden spoon on a clothed backside. It stings, it gets the point across that, “This is not acceptable.” I told the boys at lunch today that I *hate* to spank. My heart’s desire is that they would regulate themselves, and choose the right thing simply because it’s the right thing and best for everyone… but in absence of that, in absence of their heart being IN on it, I’m choosing their behavior for them. I want their hearts. I want their understanding — for me to understand them, and them to understand me. I want them to trust that Mom & Dad haven’t just established random rules to torment them, that we have the best and purest intentions, and with that trust, take what we say to heart and do their best to follow it. Right now, though, their hearts are in Selfish Disobedient Land, they don’t understand us, and they don’t trust us. Not because we’re not trustworthy, but because they are mistrustful of *ANY*thing that doesn’t bow itself down to 100% of their whims. Some parents do that, but I think that is unwise, unhealthy, ungodly, and ultimately sets them up for all sorts of destruction — self-inflicted, inflicted on others, and others inflicting it on them. I’m weary of waiting for their maturity to show up, weary of the correcting, cautioning, yelling, reasoning, pleading, imploring. So, I’m pulling in the reins. I’m holding on for a bumpy ride, but thankful that my hubby is totally with me on this, and if nothing else, it’ll strengthen our teamwork. I got this from Helen…. well, no, that’s not true. I had to get it from her friend Kerryn. Helen had turned it into a tea meme, since she doesn’t drink coffee. I love tea, but not more than I love coffee. Tea’s for night time, IMO. Your first cup, when do you drink it? As soon as possible after waking up. 95% of the time, my hubby brews the coffee, and he usually grinds the beans the night before and sets the timer on the coffeemaker. Then, he fixes my cup just so, and often brings it into me when he awakens me for the day. Hubby+cuppa coffee = the perfect alarm clock. Usually two. They’re bigger than your standard 6 oz cup, but it’s half-caff. Half-caff. That way I can drink twice as much. Half-and-half (the REAL stuff – no flavored “International Delight” cr@p for me, thank you very much) and raw sugar. For about six months, I tried to stem my sugar intake by putting half a stevia packet in my coffee w/ only a little bit of sugar, but I started longing for the “real” taste of coffee, and recently gave that up. Your favourite way of brewing? I love the stove-top percolator that we use whilst camping, but I think that’s due to the romanticism involved — wind blowing, anticipation, camp fire… Otherwise, it’s just the standard Mr. Coffee drip machine. With whom do you prefer to enjoy your coffee? Starbucks beans. But, that’s usually too expensive, even from Costco, so we buy the Kirkand (house brand) beans from there, that are “roasted by Starbucks.” I’ve heard that coffee-super-snobs proclaim Starbuck’s coffee to be burnt, but that must be how I like it — burnt, strong, and extra-hot. Where do you prefer to drink your coffee? I highly prefer to drink my first cup outside on the back patio. However, I haven’t been doing that since my baby was born, 11 months ago. 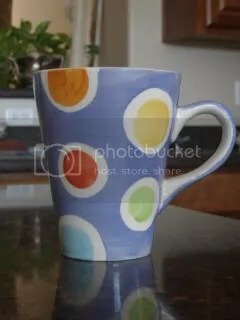 What does your favourite cup look like? It’s a large (probably 14 oz) handpainted mug that I picked up from a Woolworth’s in Scotland. I semi-regularly break all my favorite mugs, but this one has lasted two years! Espresso, Cappuccino or Latte Macchiato? Lattes are for wimps. But, I’m not manly enough to drink espresso, either. I like cappuccino, and when I’m feeling fancy, I have ’em put a shot or two of almond syrup in it. Favourite occupation while drinking coffee? Reading. Or birdwatching on the back patio. It’s hard for me to drink coffee and stand. I have to be sitting to drink it, meaning that if the morning gets too busy and finds me on my feet, the coffee does not get drunk. So. I was in a conversation, of sorts, with a guy on another woman’s blog. Really, it was a pointless discussion, because he obviously didn’t thoroughly read (if he read at all) my comments, and he misconstrued virtually everything I said. It was frustrating to me, but, hardheaded as I am, even I can eventually tell when arguing becomes completely pointless, and possibly counterproductive. In my observation, Jesus was a master at engaging people in just the right way in conversation. With those who were truly curious, and who truly wanted to learn, he’d speak at length. But, for those who were simply combative, or who harbored ill motive, Jesus would keep his answers extremely short, or simply not answer at all. I should take that to heart. Some people just aren’t worth arguing with. Something that caused me to think a bit, though, was… well, the guy mentioned above started going off about evolution, which was no where near the OT. I stated that I was a young-earth creationist, and supplied a link to my fave website on the topic. He replied: ” For some reason, an acceptance of evolution seems to challenge your faith.” My personal response to this was, “Huh?? ?” Just because I believe one thing, and someone else comes back with, “Well, I believe the opposite,” doesn’t mean that my faith is challenged. I think I may have blogged about this before, but a camp I went to right after I graduated high school solidified my attitude on my challenges presented to my beliefs. Dr. David Noebel said something like this: “If someone shakes your beliefs, take a good look at what they’ve said. If you investigate and determine that they’re right, well, you need to change what you believe. But, if you investigate and determine that they’re wrong, it will only serve to further solidify your beliefs.” IOW, one way or another I should not be afraid of someone stating something that is outside of my own personal beliefs. And, to the best of my awareness, I’m not. After 13+ years of a myopic Christian education, which told me that Christianity was right and everything else was wrong, but never investigated that “everything else” and never educated us as to why Christianity was right, I decided that my kids’ education would be different. That’s one of the reasons I chose Sonlight. My own faith isn’t challenged when someone likes Harry Potter. My own faith isn’t challenged when someone lets their kids watch Power Rangers. My own faith isn’t challenged when someone thinks old-earth evolution and Christianity are compatible. My own faith isn’t challenged when I meet a Hindu. I’ve made different decisions for myself, based on what I believe is right. I do believe there is real truth, and as best as I know it — as revealed by God’s word, by His revelation, by the witness of the Holy Spirit in my heart — I cling to it. But, as best as I can, I also make allowance for others, knowing that there are a lot of cultural differences, personal preferences, personal convictions, personality differences, and other factors that go into forming the beliefs of one person or another. In the aforementioned blog, the guy with whom I was unwisely arguing asked me why I thought other Christians were wrong for not believing as I do. But, I don’t think I have that stance. As far as the Christian faith goes, there are some things that I believe are standards. But, there’s a wide variance as to what one can believe as a Christian. Just within my family, I’m thinking of my Uncle Steve, undoubtedly a Christian, who has kids my own children’s age, and he reads Harry Potter to them. Or my cousin Jeana, who is a nun in the Catholic church, who is, again, undoubtedly a Christian. Or my Aunt Sue, who is really into the Lutheran Church Missouri Synod. All have beliefs that vary pretty widely from my own, yet I know for certain that — even though they don’t believe the same thing as I — they are most certainly Christians. It’s a fine line: that between truth and preference. I think it’s up to each person to follow the convictions that the Holy Spirit places in their heart when deciding where to hang their hat, so to speak. I really enjoy (for the most part) learning about what others believe. And, as I feel led, I alter what I believe when I find that becomes appropriate. But, that usually doesn’t happen simply because someone is trying to shame me in a blog post. I am planning a trip for myself and my four kids to visit family & friends in the Midwest. Ideally, I’d like my hubby along, but a) he’d rather prioritize the 2 weeks’ vacation time for a leisurely family camping trip and/or a church ministry trip, and b) he’s not absolutely as thrilled as I am to visit my personal friends and my own extended family. Rather sitting here, wishing my hubby *really* wanted to visit all the people whom I love, I decided to go on my own. I took a similar trip necessitated by my Grandfather’s unfortunate passing, nearly 2 years ago now. That trip, with my then-three children, flying across the country and renting a car for our travels, was successful beyond even my highest hopes. I now have four childen, including an almost-one-year-old, so I’m a tad trepidatious about the combination of mom+three boys+baby+air travel+car rental+two weeks, but my desire to visit the family & friends supersedes those feelings. Neither my hubby nor myself really wanted him to be lonely, twiddling his thumbs at home, waiting for our return, so I was thrilled to be able to make our trip concurrent with a ministry trip he’ll be taking to the northest of Scotland. Also, his brother has agreed to come stay w/ him while we’re gone, and stay with our doggie while we’re all gone, as I’ll be gone longer than my dh. That works out great. Southwest Airlines had a great sale on one-way fares, and after some hemming & hawing & semi-procrastinating whilst I waited in hope that everyone’s plans would mesh with ours, the dates for Martin’s trip solidified, and I went ahead and purchased the tickets, with one day left on the sale. The one-way tickets allow us to fly into Tulsa and fly out of Chicago, making stops enroute. Last trip, I booked a car via Priceline, getting a smokin’ deal, for which I paid (if memory serves) about $230 for 12 days of travel. I thought, “Certainly this time I can find a minivan for fewer days and pay less than $400.” <AAANNNAAHHHHH. Buzzer sound.> I found out that, in general, car rental places don’t like for folks to make one-way rentals, and when folks do, the rental agencies are likely to charge a HUGE “drop fee” for the privelege of renting their vehicle in one city and leaving it in another. Priceline won’t even book one-way car rentals. So, I was looking at a rental of close to $1000 for less than two weeks!!! That’s more than we paid for airfare for the five of us!!! Oh, my goodness. Well, the good news is that after a LOT of searching, I’ve determined that the best route is to take the minivan from Tulsa to St. Louis, then pick up a smaller vehicle in St. Louis for the remainder of our travels. I finally found ONE rental agency (Budget) which would let me rent the smaller vehicle in St. Louis, and would not charge a drop fee when I returned it in Chicago. I also FINALLY found the perfect storm of deals: If I pick up the vehicle away from the airport, if I pick it up on a Saturday, and if I apply the discount/coupon code which Budget so readily made available on its website, I could rent a premium car (on which, for God-only-knows reasons, Budget is running a special, making it even cheaper than a compact car) for 10 days for $490. That’s still way more money than I wanted to pay. It’s still way more money than I’d have to pay if I rented from virtually any other agency in St. Louis and returned it to St. Louis. I still have to find us a one-day rental that will take us from Tulsa to St. Louis. BUT, it’s a heckuva lot better than the $1000 pricetags I’ve been looking at for the last week+. And, to think I had us fly out of Chicago instead of St. Louis to save us ONE HOUR of driving time. The flights out of both cities were the same price, and at the time of booking my flight, I thought, “Wow! Save an hour of driving, and fly home from a greater distance for the same price! !” But now, I realize that if I had booked our return flight out of St. Louis, I could have saved $200 (or nearly so) on car rental. Expensive hour. Oh, well. I’m still thrilled that this trip, which I’ve been trying to make happen for more than a year, and which kept getting postponed, is *really* going to happen. Yay! !